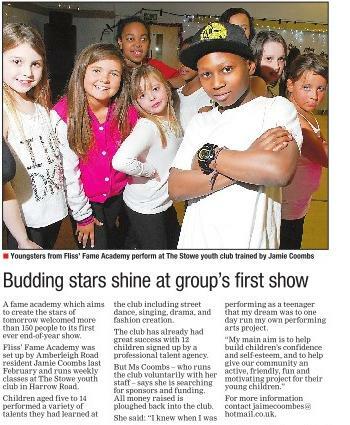 Xmas Show 2011 hits the press! Fliss’s Fame Academy Xmas Show 2011! The local Newspaper Wood and Vale came along to the Xmas Show and captured the kids, from W2, spectacular performance on the day. They were performing ‘Street Dance’ ‘Singing’ ‘Drama’ and created and performed their own live Kids Fashion Catwalk. Many of the children were spotted by talent agency’s that were also there on the day and were given a chance to perform in top celebrity music videos! ← Molly Mcdonaugh singing Mariah Carey’s Santa Claus is Coming to Town!